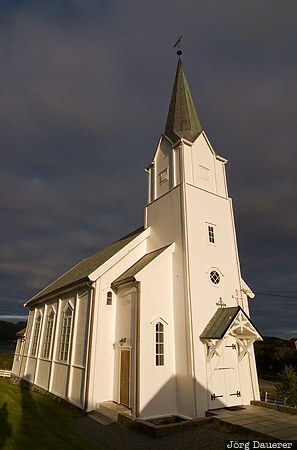 The white wooden church of Eidet illuminated by low evening light in front of dark storm clouds. Eidet is on the island Langøya, part of the Vesterålen archipelago, Nordland, Norway. This photo was taken in the evening of a cloudy day in August of 2010. This photo was taken with a digital camera.